Picasso returns to monumentalism with this gigantic work, measuring 205 cm x 174.5 cm (7 x 5.5 ft). The size of the canvas enforces the-immense statuesque proportions of the figures. Like the earlier Three Women at the Spring (1921) these male figures appear to have been carved like Classical Homeric statues from the hunks of stone behind them and then imbued with life, possibly by the music from the magical pan pipes. The thin black lines around their frame and shadowing helps lift them off the picture surface to complete the sense of chiselled separation. Pan, an ancient Greek god and patron of pastoral poets, was also a symbol of fertility and love. He played his reed pipes, formed from a nymph who metamorphosed to escape his amorous clutches. Pan was said to be dangerous in the midday heat, as represented so intensely in this picture; the deep heat emanates from the fierce blue colours in three horizontal bands. Another possible source of influence is series of bather paintings by Paul Cezanne, such as The Large Bathers, and particularly his images of mole bathers, works with which Picasso would probably have been familiar. 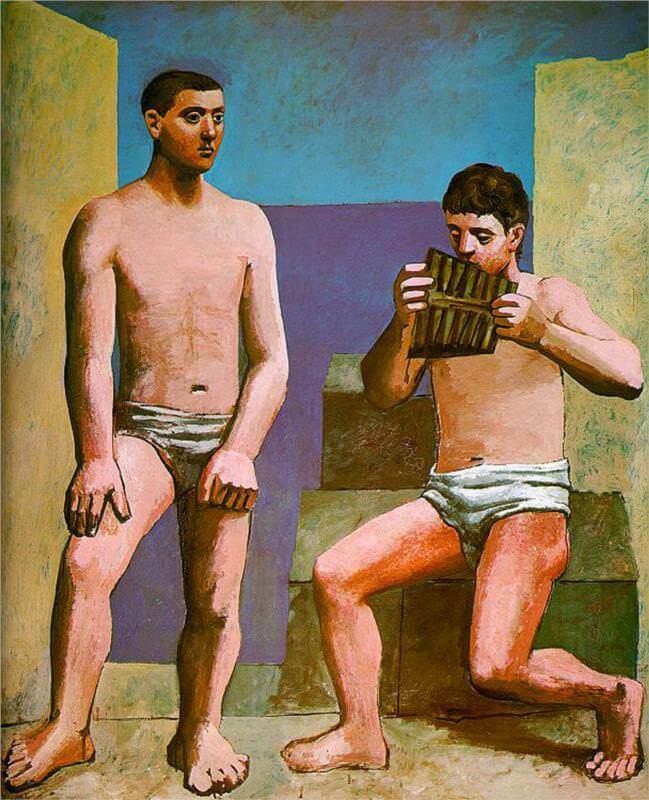 This work sees a development of Picasso's life-long artistic fascination with male sexuality wrapped in images from mythology. The face on the left recalls earlier self-projections, such as Self-Portrait (1907), and suggests the 42-year-old artist's contentment with his own creativity and virility.